Things you Can’t miss in Central otago! Central Otago is on most backpackers’ “hit list” when road tripping around the South Island. The lakes, the mountains, the blue rivers, quaint towns, epic adventure activities… This South Island region has huge appeal! Make the most of the Central Otago region by hitting the highlights that we suggest in this list of Central Otago must-dos! Of course, you’ve probably heard of Queenstown and Wanaka and no doubt you’re checking them out. However, Central Otago has a lot more hidden gems to uncover which this must-dos list for Central Otago aims to share with you. Explore the characterful Kiwi towns of Alexandra, Cromwell, Clyde, Ophir and so much more on an epic road trip (or cycle trip) in the Central Otago region. 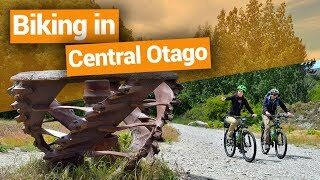 If you really want to see it all in the Central Otago region then you need to hit the Otago Central Rail Trail! Bike this 150km journey of discovery along a this old railway route seeing quaint New Zealand towns, mountain scenery, rocky landscapes, tunnel, viaducts and much more. The trail between Middlemarch and Clyde is one of the New Zealand Great Rides and regarded as one of the best bike trails in the South Island. Location: Between Middlemarch and Clyde. 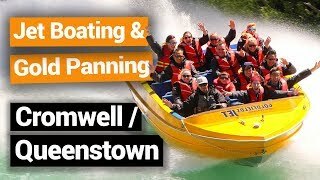 Queenstown is on the top of most travellers’ bucket lists when they come to New Zealand so we really don’t need to give it much of an introduction. In the “Adrenaline Capital of the New Zealand” you really won’t get board with the likes of bungy jumping, skydiving, jet boating, luging, canyoning swinging, paragliding, rafting and so much more going on! For our picks on the things you can’t miss in Queenstown, head on over to our must-do list for Queenstown. Cromwell is known as the “Fruit Bowl of the South” thanks to all its orchards and vineyards. However, the Central Otago town has another (and perhaps more exciting) claim to fame which is the Highlands Motorsport Park. Hop into one of their supercars and experience an international standard race track. Or race your mates on their 650m go-karting track. Central Otago is dotted with quaint and characterful towns that sprouted during the Central Otago gold rush in the 1860s. One of the most picturesque is the little town of Ophir right in the heart of the Central Otago region and along the Otage Central Rail Trail. Send a postcard with the unique gold mining postage stamp at the mud-brick post office. As you’ve guessed, gold mining was kind of a big deal in the Central Otago region. Did you know that you can still find gold in the rivers today? Check out the Goldfields Mining Centre along the stunning Kawarau River gorge where you can pan for gold, do a guided or self-guided tour of the historic gold mining equipment (while getting awesome views of the river gorge), and more! Location: Along the Kawarau Gorge between Queenstown and Cromwell. One of the most popular hiking trails in the Central Otago region is Roy’s Peak and for good reason. Get some sensational views of Lake Wanaka and the Mt Aspiring National Park from atop the peak. The walk is a full day 56-hour return walk takes you along farmland to exposed hillsides and eventually to the all-encompassing views of Roy’s Peak. See our other Wanaka favourites in 10 Wanaka Must-Dos. Location: Roy’s Peak, Mt Aspiring Road, Wanaka. 7. Try Curling in New Zealand’s Only indoor Curling rink! 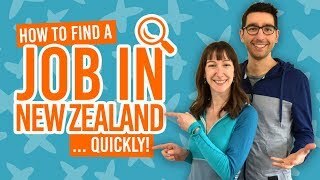 For a truly unique activity in New Zealand, why not try curling?! The Southern Hemisphere’s only dedicated ice rink is right here in the Central Otago region in the little town of Naseby. Your coach will show you the ropes (or more like the stones) then compete as if you were in the Winter Olympics! Alexandra is an awesome town to base yourself for bike trails and even fruit picking work if you are on a working holiday visa. However, the first thing you should do when you get there is to walk to the Alexandra Clock on the Hill. It’s a short but steep walk to get some awesome views of the town, mountains ranges and rivers of the area. Literally drive into Paradise (there’s an area of Glenorchy called Paradise) on the scenic road trip between Queenstown and Glenorchy. Follow the winding yet stunning road on the shores of Lake Wakatipu where the mountains get grander and more dramatic along the way. Once in Glenorchy, check out the cafes, go horse trekking, kayak on the Dart River or start the Routeburn Track, one of the New Zealand Great Walks. A popular trip from Wanaka is along the Haast Pass. Travel through the forested mountains discovering waterfalls after waterfalls, as well as the incredible Blue Pools of Haast. There are many short walks and pit stops along the way as the road goes all the way into the West Coast region.